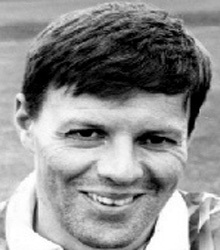 Graham Buckley (Forward, 1990-93, 1995-96) – ‘Wee Bucks’ was a very popular player in his 2 playing spells with Cowden. Son of ex-Aberdeen and Scotland star Pat Buckley who he closely resembled in style and stature, Graham played with Edina Hibs and Melbourne Thistle before joining Dunfermline. Spells with Haddington Juniors and Prestonfield Links United followed before a return to the seniors with Berwick. Then Bucks went to Brechin before signing on for Cowden in 1990. The ‘wee postie’ became a hero of the promotion winning side of 1991/92 with his 21 league goals and was the B & Q 2nd Division Player of the Year. He formed a devastating front line partnership with Peter ‘Sumo’ Lamont. He later left Cowden for Arbroath and then was back in the juniors with Newtongrange Star for a spell before his brief return to Cowden in season 1995/96. Later he returned as a coach at Central Park for a very short time. He has several footballing brothers and was managing Craigroyston not so long ago.